Recorded sound had no greater friend than Tony Schwartz, the audio documentarian, advertising guru, media consultant, and exalted citizen of the aural universe, who passed away Saturday a few months shy of his 85th birthday. He'll be forever linked to his best-known work—the infamous "Daisy" ad from Lyndon Johnson's 1964 re-election campaign (see clip, above)—but to many, Schwartz is beloved for sharing with the world his lifelong infatuation with the musicality of prosaic sounds. Beginning in 1945, Schwartz, armed with a microphone and Webcor wire recorder, set out to capture the sounds of the world around him—the dogs barking, the kids playing, the street-corner preacher, the cab driver's running monologue—for the pure pleasure of it. Afflicted since the age of 13 with chronic agoraphobia, Schwartz was incapable of traveling more than a few blocks from his apartment, so he made field recordings of the sounds of his Manhattan neighborhood and released them on a series of long-playing albums, the most prominent called New York 19 (named for the local postal zone which would later be renamed NY, NY 10019). Despite the fact that he didn't travel, or maybe because of it, Schwartz nursed an outsized case of wanderlust, which he began to satisfy sonically by trading tape recordings with people all over the globe. In just a few years, he'd amassed a staggering collection of audio documents, folk music performances and far-flung greetings from other amateur recording enthusiasts in nearly four dozen countries. 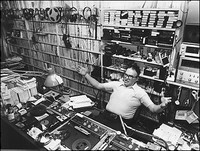 Over the years, Schwartz produced 19 full-length LPs of his various audio collections. One of these albums, Exchange: Friendship Around the World Thru Tape Exchange, (it was later retitled The World in My Mail Box) contains a sampling of tapes Schwartz received from such outposts as Haiti, India, Norway, South Africa, Peru as well as North American locales like South Dakota, New Mexico and Pittsburgh, PA. In addition to the albums of audio wonderment he produced for Folkways and Columbia Records, Schwartz had another significant platform from which he shared his sweet and eccentric observations: For 31 years he broadcast a weekly program on New York's public radio station WNYC. (Go here to hear a captivating 1961 broadcast of Schwartz's audio magazine "Adventure in Sound.") "The best thing about radio," he once said, "is that people were born without earlids. You can't close your ears to it." Over the course of his many decades spent hunting and gathering the euphony of the everyday, Schwartz became a keen observer of human communication and specifically the human voice. Through the countless hours he spent listening up-close to the subjects he recorded, Schwartz came to understand that most persuasive speech invoked a kind of participation on the part of the listener, striking what he called a "responsive chord." This analysis served him well in his career as an advertising executive and media theorist. (Marshall McLuhan dubbed him the "guru of the electronic age"). 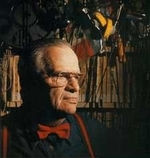 Working from his home studio, Schwartz produced thousands of television and radio spots, developing innovative approaches that became standard practice in the industry. He also designed and produced memorable political advertising. In 2007 Schwartz's entire body of work was acquired by the Library of Congress, which is planning to digitize his recordings, ads, and political spots and make them available to the public. This is a fantastic post, and I almost feel bad about the following, but I have a language nit to pick: the word "acute" doesn't mean what you want it to mean here, more like the opposite of what you mean. You want "chronic". Thank you for the correction. I wrote this piece while I was at work—as a copyeditor! Good to know that I can compartmentalize my personal work from my professional duties. I have changed the phrase "acute agoraphobia" to "chronic agoraphobia." The first time I heard a Tony Schwartz recording it blew me away. It was called "Nancy Grows Up" and it seamlessly combined recordings of his niece from various ages, baby sounds to teenage concerns. His recordings are serious treasure and he will be missed. More than pleased to read they will be available at the LOC. A fine tribute here, kudos. The "Nancy Grows Up" sequence is AMAZING and I provide the link to it above. 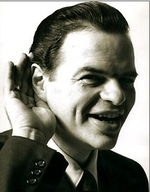 If you go to the 1961 WNYC radio show "Adventure in Sound" that I link to, you will see a link at the bottom of the page "Listen to the Whole Show." That program IS the Nancy Grows Up recordings! Absolutely mesmerizing. thanks for your scholarship and enthusiasm doug and for introducing me to Tony Schwartz. i'm really enjoying these recordings, what a fascinating and inspiring person. Knowing a genius your whole life doesn't mitigate the awe in any way - Tony never ceased to amaze the family. As for the "Nancy Grows Up" piece - my sister died very suddenly at the age of 26. She was ill for two weeks only. To have this document (which is on my desktop) to keep with us is an indescribable comfort, a talisman against dimming memory. Tony really helped to shape the world as we know it, and no encomium is too great. But as much as he saved the world, he saved our family. A lot of Greats are flawed as humans. Tony was, as posted above, fascinating and inspiring - but he was gentle, caring and aware as a man. So terribly sorry to hear about your sister, Elizabeth. Thank you for sharing Nancy, and your Uncle Tony, with all of us.